Museum Trucks Were On Display At The Oak Grove Truckers Jamboree! 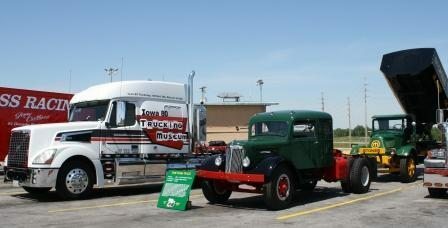 The Iowa 80 Trucking Museum’s Newly restored 1937 Mack AC and 1946 White WA22 went on a road trip! They were on display June 8th and 9th at the Oak Grove Truckers Jamboree in Oak Grove, Missouri. The Oak Grove Truckers Jamboree is hosted every year at the Oak Grove 70 Petro, I-70 Exit 28, Oak Grove, Missouri. The Truckers Jamboree is a great place to celebrate and learn about trucking and those big rigs. It’s our way of saying thank you to the millions of truck drivers that deliver the goods we consume, whether it’s groceries, gas, clothes or cars — you can bet it was delivered by a truck. The Jamboree was a great event and the Iowa 80 Trucking Museum was very excited to be a part of it! Click here for more information about the Oak Grove Truckers Jamboree.